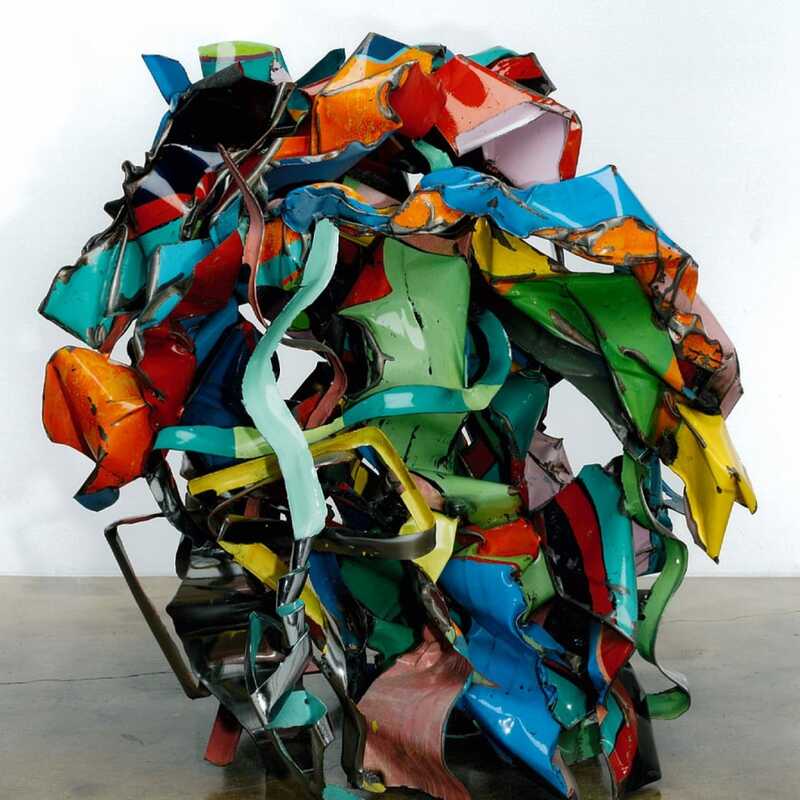 John Chamberlain was born April 16, 1927, in Rochester, Indiana. and grew up in Chicago. After serving in the Navy from 1943 to 1946, Chamberlain attended the Art Institute of Chicago from 1951 to 1952. During this time he began to make flat, welded sculpture influenced by the work of David Smith. Chamberlain taught and studied sculpture at Black Mountain College, near Asheville, North Carolina, from 1955 to 1956. In 1966, Chamberlain received his first of two John Simon Guggenheim Memorial Foundation Fellowships, intended for men and women who have "already demonstrated exceptional capacity for productive scholarship or exceptional creative ability in the arts." In 1957, building on his earlier welded sculpture, Chamberlain began incorporating scrap metal from cars into his work. From 1959 onward he concentrated on sculpture built entirely of crushed automobile parts. Chamberlain's first major solo exhibition was held in 1960 at Martha Jackson Gallery, New York. In the early 1960s, Chamberlain's work was widely acclaimed. His sculpture was included in The Art of Assemblage at the Museum of Modern Art, New York, in 1961. Chamberlain showed frequently at the Leo Castelli Gallery, New York. In 1964, his work was exhibited at the Venice Biennale. From 1963 to 1965, Chamberlain experimented with other media and created geometric paintings with sprayed automobile paint. In 1966 he began a series of sculptures made of rolled, folded and tied urethane foam. The Solomon R. Guggenheim Museum, New York, held a retrospective of his work in 1971, which was followed by a retrospective at the Museum of Contemporary Art, Los Angeles, in 1986.